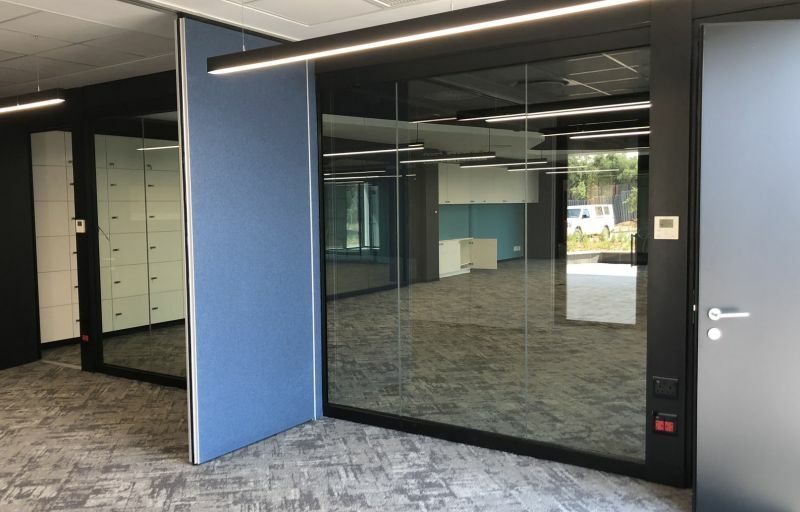 Aluglass Bautech installed approximately 186 running metres of its GF Serene acoustic demountable partition system with a height of 2,5m, and an acoustic rating of 45dB was specified. The profiles are powder-coated black with matching skirtings. This is the ideal acoustic internal glass partitions system to create quiet office spaces or meeting rooms within open-plan applications. In addition, it is quick and easy to install, remove and reinstall, with modular glass elements and flexible frame components. By using 1 200mm modular panels with extra make-up panels, the system can be easily relocated in a new position. The framing system can accommodate cable installations if required, and the glass panels, which are slid into place, have 180° glass-to-glass joints which are dry-joined with a transparent VHB joining tape (not wet silicon). The GF Serene system further integrates with the Varikust® VK63 acoustic door, which provides sound insulation of 35dB. These doors are available in single- and double-door configurations. 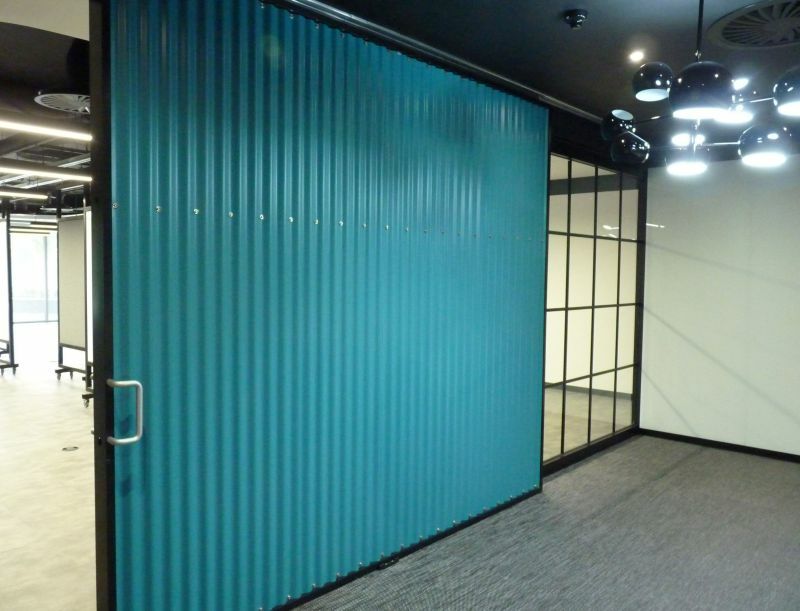 Over 50 Varikust® VK63 acoustic doors were installed at Accenture. 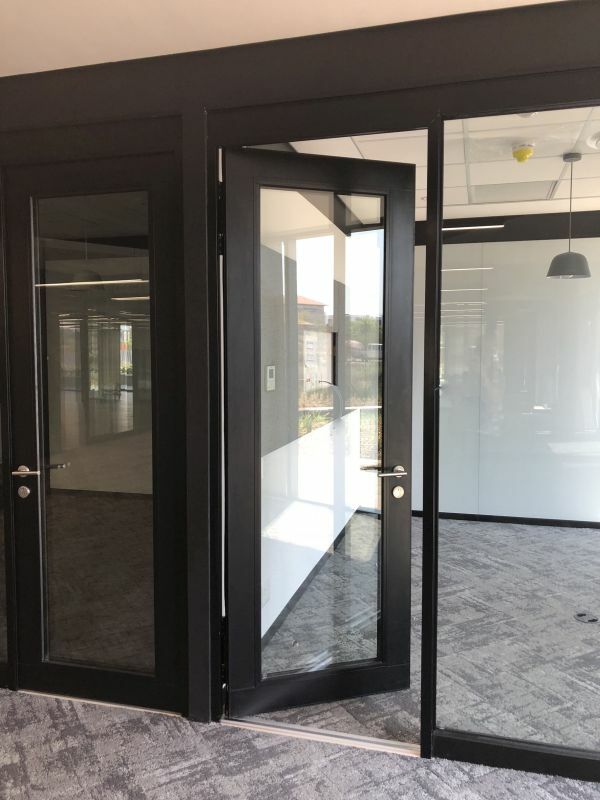 Of these, 30 were Varikust® VK62G 35dB double-glazed acoustic doors (2 485mm x 825mm) and 19 were Varikust® VK62 35dB single-leaf doors, finished in black melawood (2 485mm x 825mm). 30 Varikust® VK62G 35dB double-glazed acoustic doors (2 485mm x 825mm) integrate with the GF Serene system. 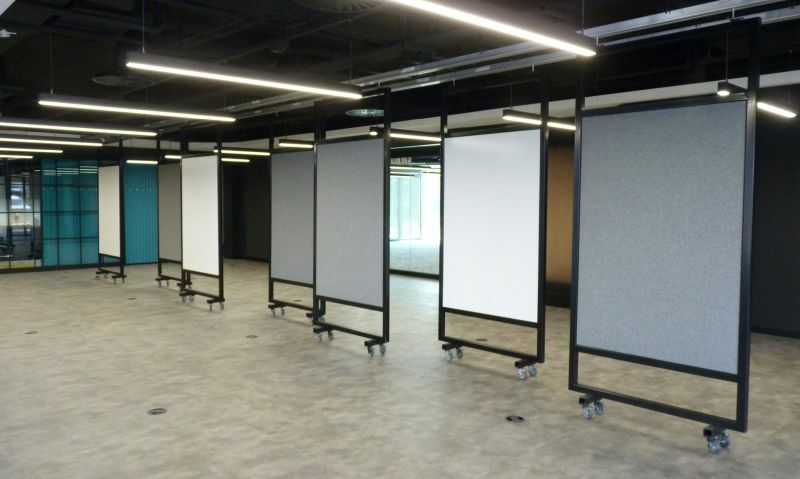 Approximately 186m GF Serene 45dB acoustic glass partitions were installed with a height of 2,5m, finished in black powder coating with black skirtings. To complete the acoustic treatment solution, four Variflex® mobile acoustic partitions were installed in the ground-floor meeting room area. This system permits flexible room layouts and subdivides meeting venues or conference facilities, only with an overhead track. Two or more areas can therefore be used simultaneously without the groups disrupting each other, or the area can be opened up with the individual elements being parked neatly to one side or into a niche. The four partition walls have an overall length of 32m and a height of 2,7m. The individual elements are either finished with MOXIWall or Weavers World design blazer fabric in the colour “surrey” on the other side. Steel-framed sliding partitions, 1 100mm wide and 2 700mm high, finished with MOXIWall finish on the one side and acoustic fabric on the other side. A Varifold® non-acoustic wooden folding door was also installed. These concertina-type doors are useful space savers and are used as a room divider. No floor track is required, allowing for an uninterrupted floor finish. The specification entailed a white melawood finished folding door with a width of 3 400mm and a height of 2 700mm. Additional custom-made products were designed, manufactured and installed to complete this project. These included automated glass sliding doors, corrugated steel sliding doors and steel-framed sliding elements with an individual size of 1100mm wide x 2 700mm high, finished with MOXIWall finish on the one side and acoustic fabric on the other side. Main image: Variflex® mobile acoustic partitions: Overall 32m in length with a height of 2,7m, finished with MOXIWall finish on one side and Weavers World design blazer fabric (colour surrey) on the other side. A Varikust® VK62 35dB double-leaf door (2 485mm x 1 650mm) with a lacquered finish (colour BLACK RAL9004).